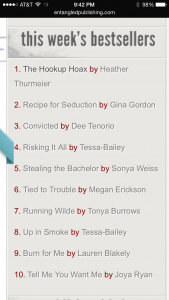 The Hookup Hoax made my publisher’s Top 10 Bestseller List!! In the #1 spot!!! Woohoo!! I can’t stop smiling! Or using exclamation marks! OMG. Thank you, thank you, thank you!! !